For forty-six years, nine unelected men and women on the Supreme Court have played God with innocent human life. The result has been a brutal holocaust that has claimed the lives of more than 62 million innocent and helpless unborn children in America. In 1973, the U.S. Supreme Court’s Roe v. Wade ruling forced abortion-on-demand down our nation’s throat. As a result, many pro-lifers resigned themselves to protecting a life here and there — passing laws which slightly regulate abortion in the most outrageous cases. Others tiptoed around the Supreme Court, hoping they wouldn’t be offended. Now the time to grovel before the Supreme Court is over. Working from what the Supreme Court ruled in Roe, pro-life lawmakers can pass a Life at Conception Act and end abortion by using the Constitution instead of amending it. A simple majority vote in both houses of Congress is all that is needed to pass a Life at Conception Act as opposed to the two-thirds required to add a Constitutional amendment. When the Supreme Court handed down its now-infamous Roe v. Wade decision, it did so based on a new, previously undefined “right of privacy” which it “discovered” in so-called “emanations” of “penumbrae” of the Constitution. Of course, as constitutional law, it was a disaster. But never once did the Supreme Court declare abortion itself to be a Constitutional right. That’s exactly what a Life at Conception Act would do. A Life at Conception Act changes the focus of the abortion debate. It takes the Supreme Court out of the equation and places responsibility squarely on the shoulders of the elected representatives who, unlike life-term judges, must respond to grass-roots pressure. 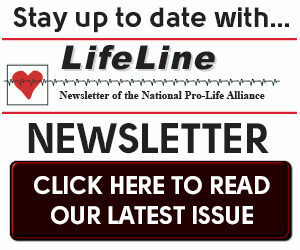 National Pro-Life Alliance members have led the fight to end abortion-on-demand by passing a Life at Conception Act. 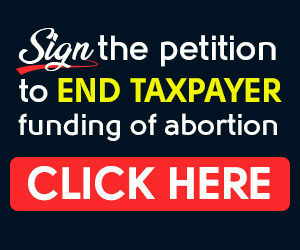 They have generated over 3 million petitions to Congress to date urging lawmakers to cosponsor and fight for passage of a Life at Conception Act. 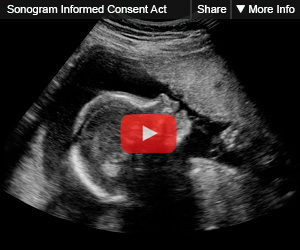 Those continued efforts have led to ever-increasing support for a Life at Conception Act in Congress. In the 116th Session of Congress, Pro-life Members of Congress introduced Life at Conception Acts in both the House of Representatives and the U.S. Senate. Thanks to the grass-roots lobbying of National Pro-Life Alliance members, the Life at Conception Act was introduced with an all-time record number of original cosponsors in the House of Representatives. 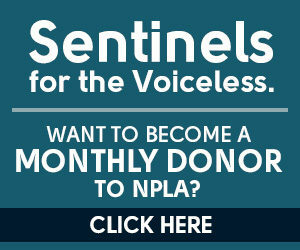 And NPLA members will continue to hold the politicians accountable, pushing for an up or down vote on a Life at Conception Act. 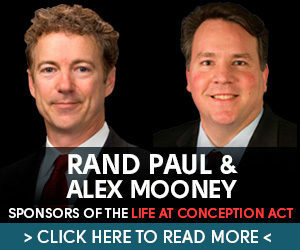 Behind the Life at Conception Act bills in the U.S. House are Congressman Alex Mooney (R-WV) and Congressman Jody Hice (R-GA), alongside Senator Rand Paul in the U.S. Senate. An up or down vote on the Life at Conception Act will put politicians on record either for or against ending abortion-on-demand. Pro-lifers are urged to call (202) 224-3121 and insist that their Congressmen cosponsor S. 159/H.R. 616 and H.R. 305. In the aftermath of Roe v. Wade, Congressman Henry Hyde, Senator Jesse Helms, and Notre Dame Law Professor Charles Rice all called for legislation to make clear that the Fourteenth Amendment’s protections apply to unborn children. President Ronald Reagan wrote in support of this “Human Life Bill” citing the author of the 14th Amendment as his authority. Today the same method to overturn Roe is advocated by Princeton Law Professor Robert George, Judge Andrew Napolitano, Constitutional Attorney Jim Bopp, the Republican Party platform and more than 130 current U.S. Congressmen and Senators.